The left ventricular assist device, or LVAD, is a mechanical pump that is implanted inside a person's chest to help a weakened heart ventricle pump blood throughout the body. Unlike a total artificial heart, the LVAD doesn't replace the heart. It just helps it do its job. This can mean the difference between life and death for a person whose heart needs a rest after open-heart surgery, or for some patients waiting for a heart transplant (called "bridge to transplant"). Like the heart, the LVAD is a pump. 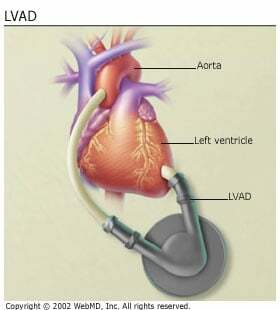 The LVAD is surgically implanted just below the heart. One end is attached to the left ventricle -- that's the chamber of the heart that pumps blood out of the lungs and into the body. The other end is attached to the aorta, the body's main artery. Blood flows from the ventricles into the pump which passively fills up. When the sensors indicate it is full, the blood is ejected out of the device to the aorta. An LVAD restores blood flow to a person whose heart has been weakened by heart disease. This helps relieve some symptoms such as being constantly tired or short of breath. And sometimes it lets the heart recover normal function by giving it a chance to rest (although this is rare). It maintains or improves other organ functions, improves exercise performance, and enables participation in cardiac rehabilitation. As with any surgery, there are risks involved. Your surgeon will discuss the risks of the procedure with you. Do you have a left ventricular assist device? Please describe your experience.